Kiyomizu-dera, officially Otowa-san Kiyomizu-dera, is a famous Buddhist temple in eastern Kyoto and is often featured in tourist information due to its unique wooden stage that juts out from the main temple building. The temple is part of the Historic Monuments of Ancient Kyoto UNESCO World Heritage site. 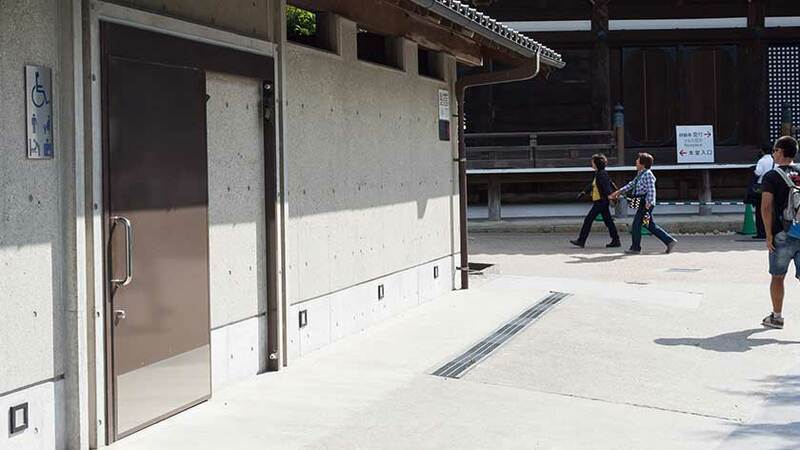 While there are some practical challenges for disabled visitors, the temple has put in a lot of work to be as wheelchair accessible as possible. Kiyomizu-dera was estableshed during the early Heian period (794-1185) by Sakanoue no Tamuramaro in 778. The current buildings were constructed in 1633 under the orders of Shogun Tokugawa Iemitsu. There is not a single nail used in the entire structure. The temple’s name means pure water, or clear water, and takes its name from the clear waters of Otowa Waterfall. 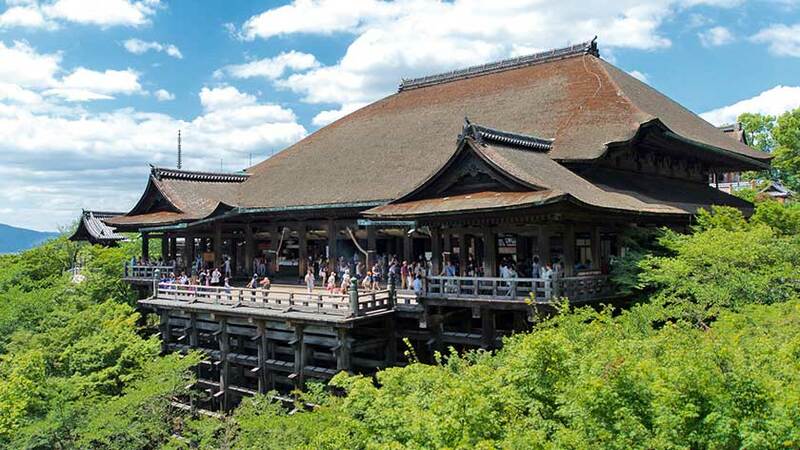 Kiyomizudera is best known for its wooden stage that is built out from the main building. 13 meters above the hillside below, the stage gives visitors a nice view of the city below, and countless cherry and maple trees that provide breathtaking scenes of color in spring and fall. The main hall houses the temple’s primary object of worship, a small statue of the eleven faced, thousand armed Kannon. There are many other shrines and halls around the complex. Kiyomizu-dera and other temples in the area are lit up in the evening during the annual Hanatoro event held in mid-March to mid-April. Kiyomizu-dera also has special lighting during the fall season in the second half of November. The path leading up to the temple is bustling with shops and restaurants that have been serving tourists and pilgrims for centuries. You can buy everything from standard souvenirs to local sweets, pickled vegetables, and Kiyomizu-yaki pottery. The temple is open daily from 6:00-18:00 (or 18:30 on weekends and holidays from mid-April until July, and then every day in August and September). For the special light-up events from mid-March to mid-April, and mid-November to early December, the temple stays open until 21:00. The entrance fee is 400 yen, but it may be waived with disability identification. 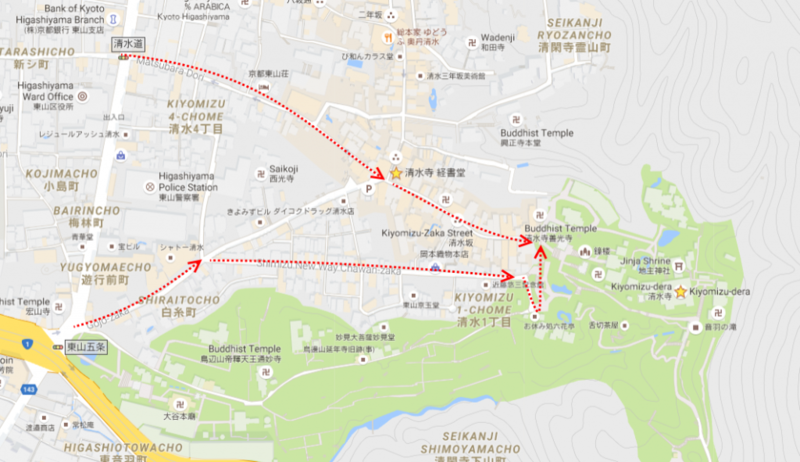 Kiyomizu-dera can be accessed from Kyoto Station by bus numbers 100 or 206, and getting off at at Gojo-zaka or Kiyomizu-michi bus stops. From there it is a 10-minute walk uphill to the temple. 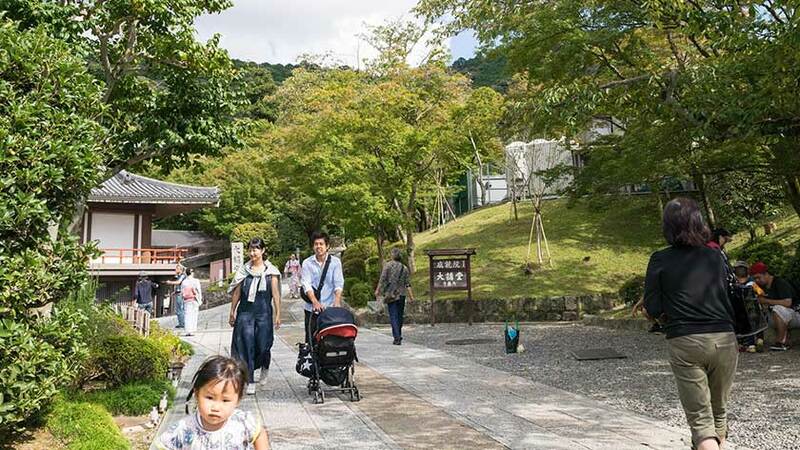 While the Kiyomizu-Gojo station is an alternative option, it is 20-minute walk (including 10-minutes uphill). 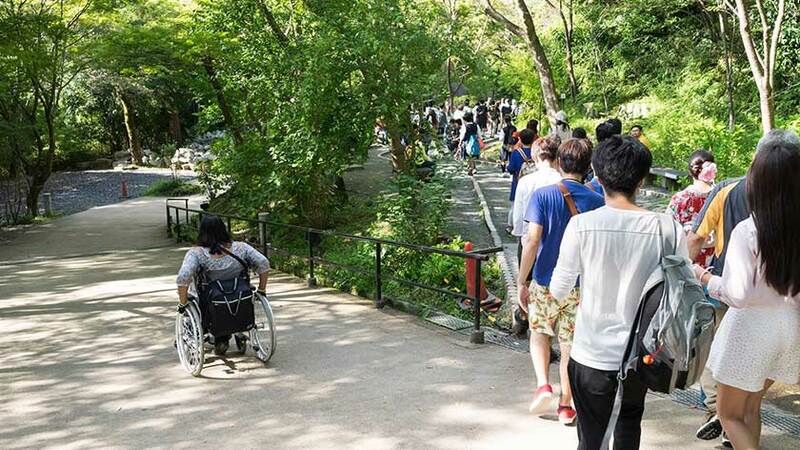 Bus are wheelchair accessible, but since they can be very crowded, it can be easier to get on at the starting point of a route (like Kyoto station) than mid-way through the route. 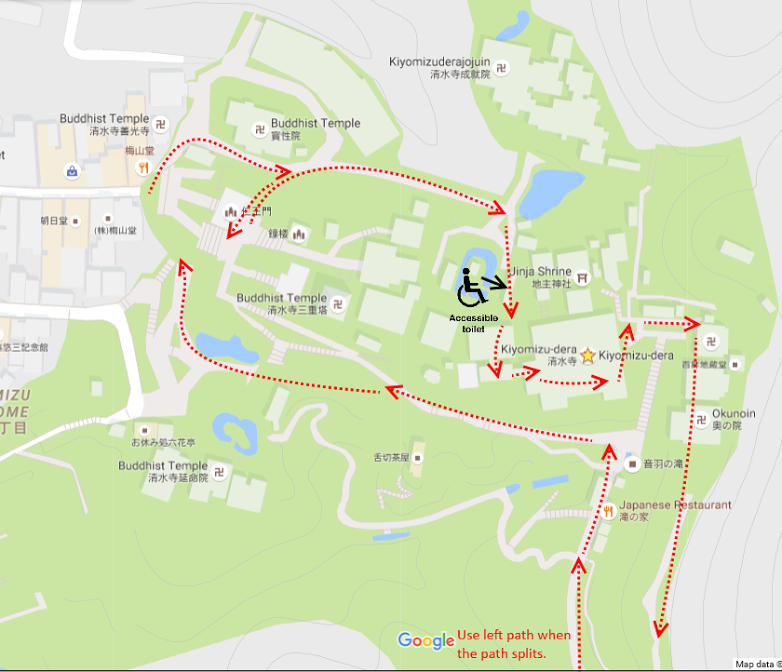 While expensive, hiring an accessible taxi can be a good way to avoid the hill to the temple. 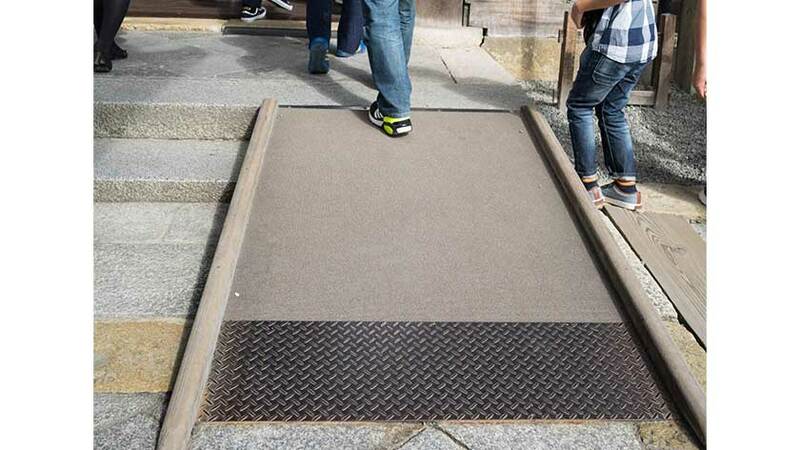 While there some definate challenges for those with disabilities, Kiyomizu-dera has put in a significant effort to make the temple wheelchair accessible. The first barrier that many will find is the walk from the nearest bus stop. The walk is at least 10-minutes and goes up a fairly steep hill. While it is fine for electric wheelchairs, those in manual wheelchairs – or those pushing manual wheelchairs – may find this a bit of a challenge. Taxis can drop off passengers at the top of the hill. 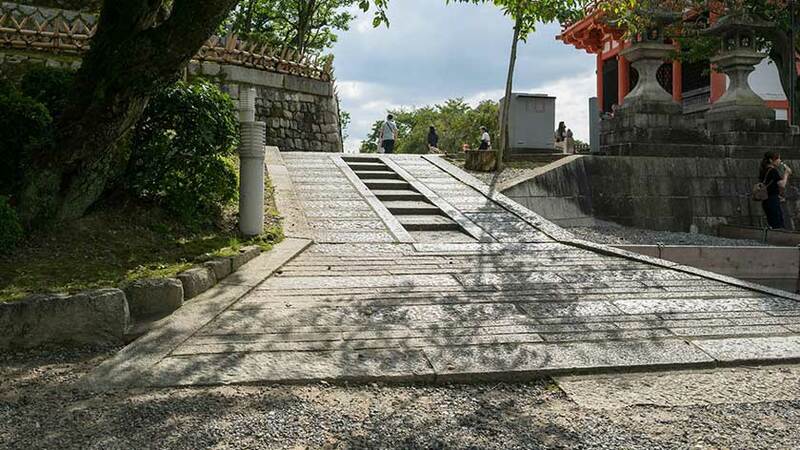 A clearly marked path starts at the first set of stairs and leads wheelchair users to a side entrance and then to the temple grounds. Unfortunately, the slope to get to the flat platform between the two first temples is the worst slope of the complex, it is steep and narrow and has a decently sized bump to get onto it. 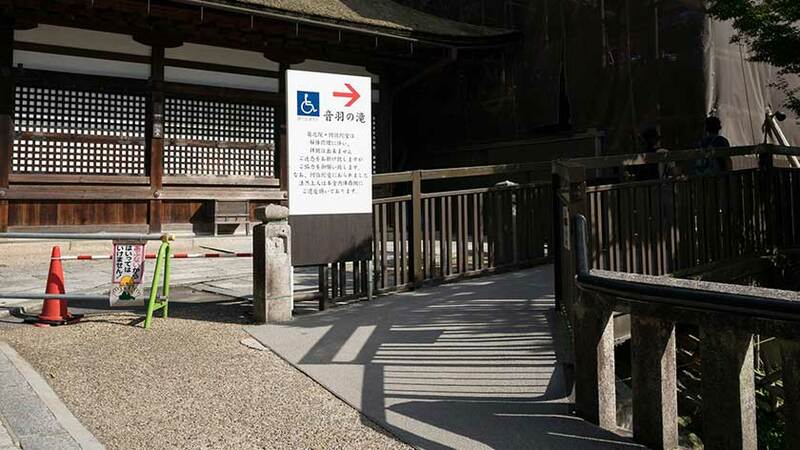 While some of the shrines cannot be accessed in a wheelchair, the main hall and the famous wooden stage have well-built ramps. Stairs cut off some of the paths further into the complex, but the wheelchair route covers a large portion of the temple grounds, eventually looping back to the start of the path. Two wheelchair accessible toilets are available. Please see the slides and map graciously provided by Shireen & Ruud. Main route to the temple, accessible but fairly steep. The entrance to the temple, the accessible route is signposted and goes left behind the main temples. The slope to get to the flat platform between the two first temples is the worst slope of the complex, it is steep and narrow and has a decently sized bump to get onto it. The fully accessible toilet, indicated on the map. Within the main temple the route is fairly obvious if you follow the signs. The slopes in the main temple itself are not steep at all, do not have a big gap between the ground and the slope and should be wide enough for electric wheelchairs. Note the slight bump to get into the temple that people are stepping over. On the way back the path forks in two. This is not well signposted but go to the steeper path on the left, the path on the right ends up with a large set of stairs. The route loops back to the main starting point, once again follow the map and the signs and you should end up at the beginning point. Google has also mapped the entire complex, so feel free to explore before you go! Kiyomizu-dera is a must-see when visiting Kyoto. Period. 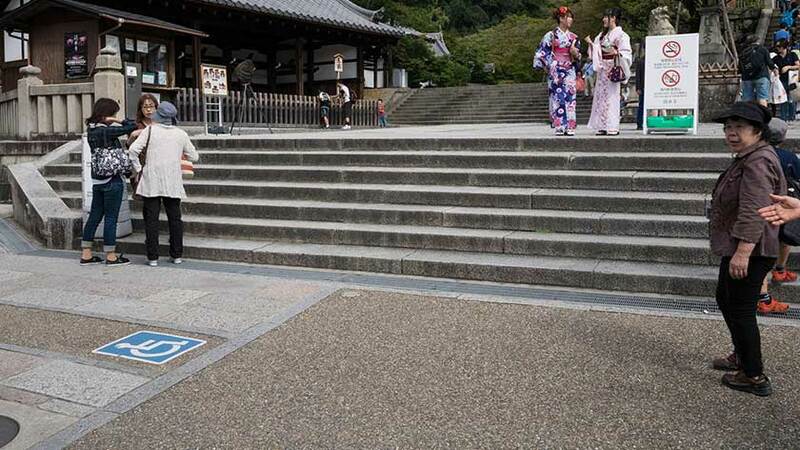 The biggest challenge for those with mobility issues is getting up the hill to the temple in the first place. We suggest taking rests at the many shops to try some local treats and wares along the way, as pilgrams have done for centuries. Once at the temple, the most important areas are accessible but crowded. 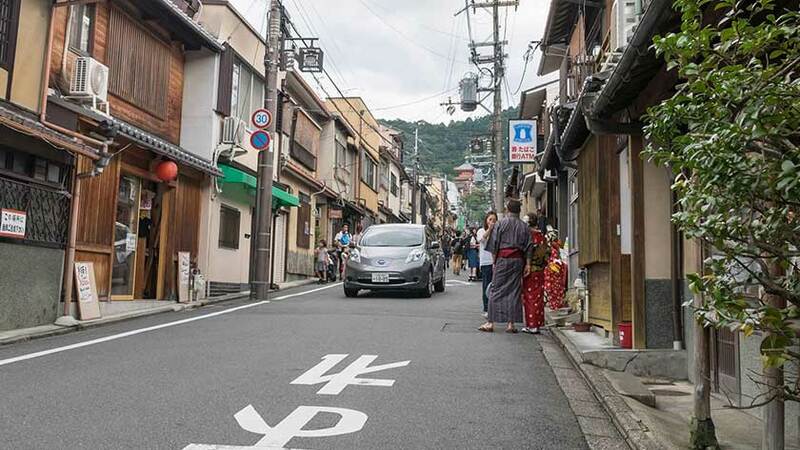 There are accessible taxis available in Kyoto, so if the hill seems daunting, it may be best to ask your hotel to order a taxi (though it may be best to do so well in advance). 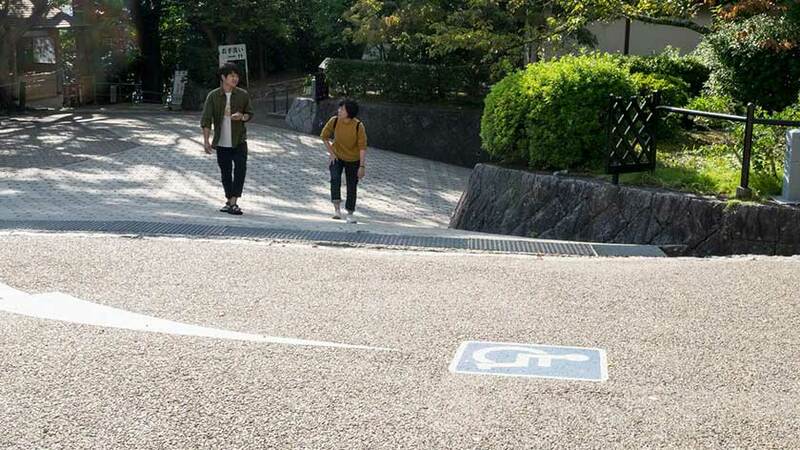 Special thanks: Accessible Japan would like to offer a heartfelt thanks to Shireen & Ruud for offering to take pictures of the accessibility features of the temple while on vacation. They also created the fantastic maps. Their contribution helps so many interested visitors. Thank you!